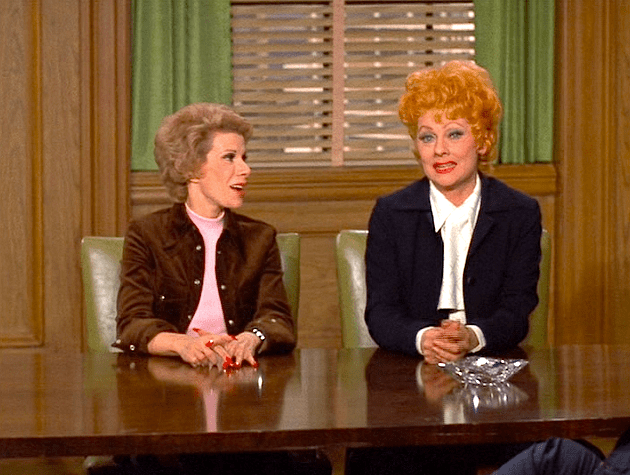 The Ten Best HERE’S LUCY Episodes of Season Six | THAT'S ENTERTAINMENT! Welcome to a new Sitcom Tuesday! 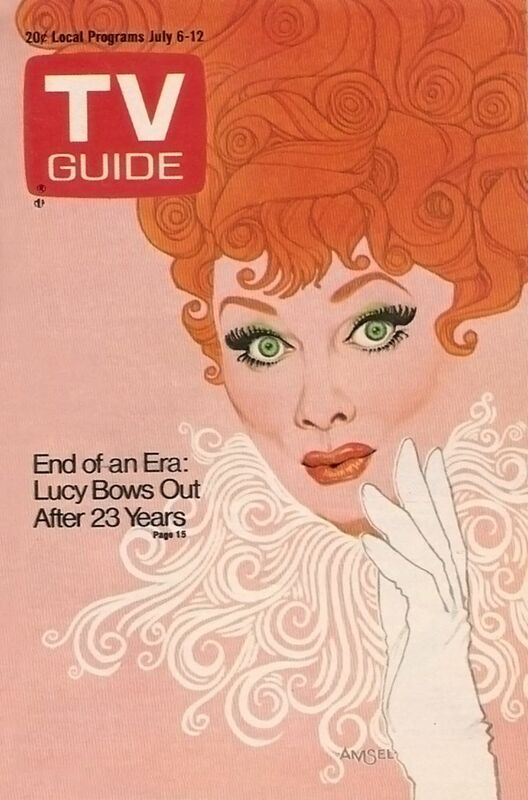 Today, we’re finishing our coverage on the best of Lucille Ball’s third half-hour television series (fourth series altogether), Here’s Lucy (1968-1974, CBS), which starred Ball, Gordon, and her two real life kids, and began production following the sale of Desilu and conclusion of The Lucy Show (1962-1968, CBS). I’m thrilled to announce that every single episode of the series has been released on DVD. Widowed Lucy Carter works as a secretary at a Los Angeles employment agency for her stern brother-in-law, Harry, all the while caring for her bemused daughter, Kim, who constantly feels the fallout of her mother’s meddlesome ways. 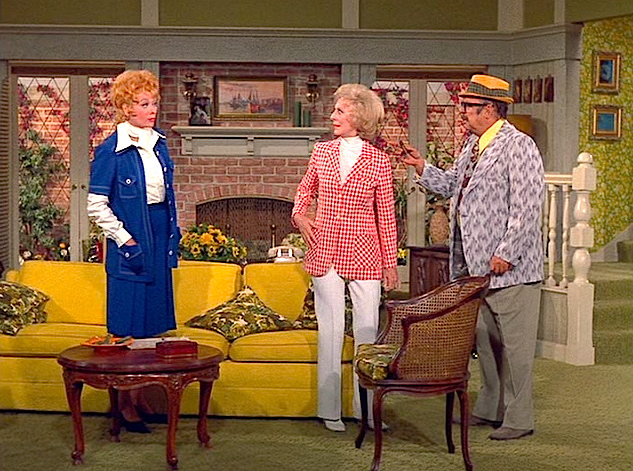 Here’s Lucy stars LUCILLE BALL as Lucy Carter, GALE GORDON as Harry Carter, LUCIE ARNAZ as Kim Carter, and MARY JANE CROFT as Mary Jane Lewis. With the elevation of quality detailed in last week’s post on Season Five, Here’s Lucy enters its final year as a much better series than it began. Again, we must thank the 1971 return of Bob Carroll, Jr. and Madelyn Davis, who, and I’ll say it once again for emphasis, crafted more realistic scripts and helped develop a quasi-ensemble made up of Lucy, Gale, Lucie (who, like last year, appears in half of this season’s installments) and Mary Jane (who appears in about a third). 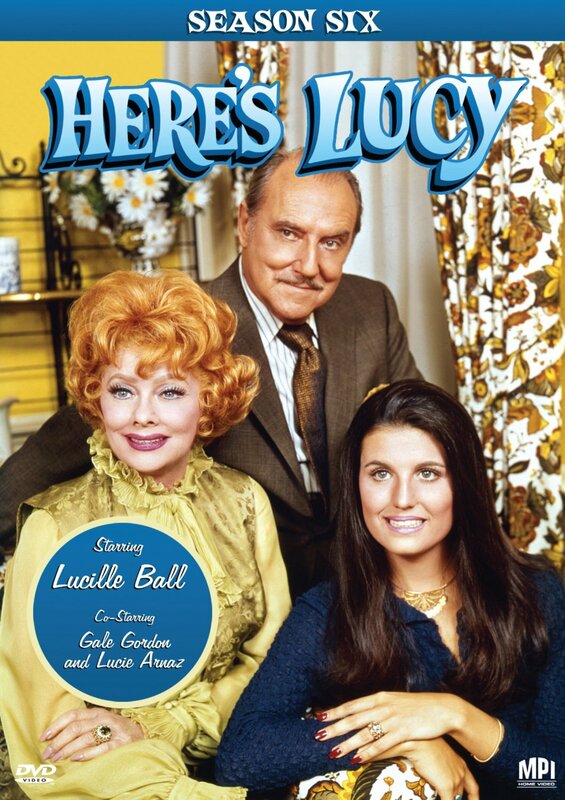 Interestingly, the final season of Here’s Lucy also happens to be one of the funniest (making this a tough list to compile), as the scripts begin to gear themselves away from the whimsical and amusing situational humor that typified the ’60s, and onto more laugh-out-loud one-liners — a hallmark of I Love Lucy (and most live audience shows of the ’70s). Of course, with more of an emphasis placed on the comedy, not everything hits the mark. In fact, unlike last season, which almost had an average level of script quality, Season Six contains episodes that don’t work. (Nothing as bad as what we saw in years Three and Four, though.) 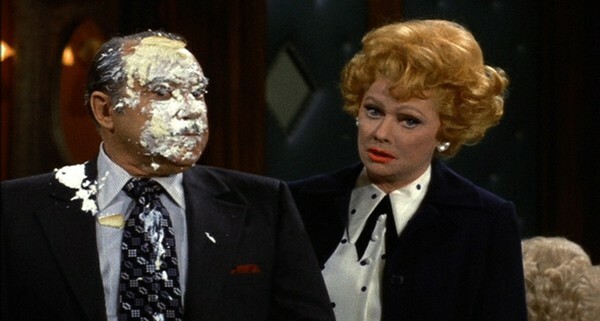 On a sadder note, this is the last full season of a Lucille Ball series. Her last venture into situation comedy turned out to be an unfortunate post-script to an otherwise illustrious career. But, I’m getting ahead of myself. Today, I have picked ten episodes that I think exemplify this season’s strongest installments. For new fans, this list will give you a place to start. For seasoned fans, there might be a few surprises. Here are my picks for the ten best episodes of Season Six. (They are in AIRING ORDER.) Note that every episode of this season is directed by Coby Ruskin unless otherwise noted. Hijinks ensue when O.J. Simpson gives Harry free tickets to an upcoming football game. This episode may be a little off-putting to some viewers because of the presence of O.J. Simpson. In actuality, this is a very funny installment with great laughs for Lucy, Harry, and (wonderfully) Mary Jane. 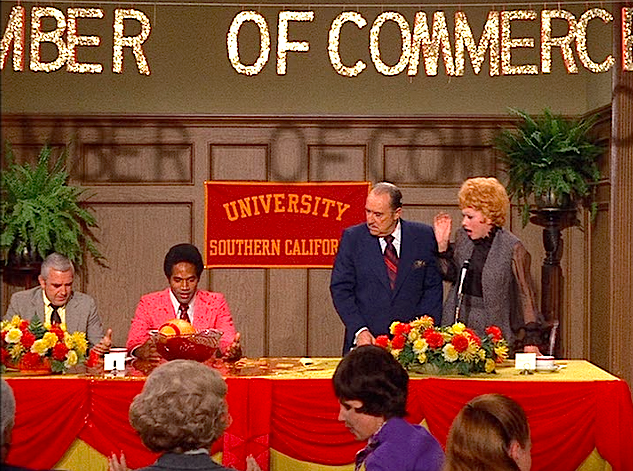 The funniest stuff occurs at the banquet — including a nice physical bit involving a football and a punchbowl — but the back-and-forth with the tickets and Harry’s ensuing arrest, albeit predictable, is amusing as well. Much stronger episode than it lets on. Lucy puts on a show of affluence when trying to obtain a loan from a bank she’s seen advertised. The series goes into full farce mode in this episode, but since everything in the script is motivated by logic — Lucy’s desire for a loan — all of the proceeding events are, while silly, completely justified within the story. Ball is MVP (anyone surprised?) and is an absolute HOOT when she goes into matron mode, but, once again, she’s backed ably by Gale and Lucie, the latter of whom is excellent as both Chiquita and Mimi. Silly, definitely. Funny, definitely. Lucy schemes to rid the house of her cantankerous new male roommate. Talk about a surprise! This episode, which boasts a guest appearance by a rotund and obnoxious Jackie Coogan, is probably a laugh-a-minute. The story is shockingly simple: Lucy needs money, so she decides to rent Kim’s room. After some unsuccessful candidates (including the always welcome Reta Shaw), Lucy lets an agency decide. When their choice is an eccentric and chauvinistic curmudgeon, Lucy decides to chase him away by feigning attraction. Naturally, this backfires. 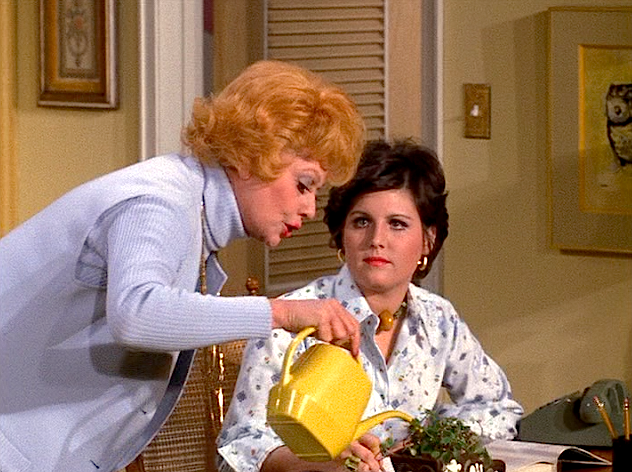 Hilarious episode — the scenes between Lucy and Mary Jane are particularly sharp. Lucy becomes the sole dissenting voter on a jury, much to the chagrin of her co-jurors. Lucy encounters a real burglar after several false alarms involving the neighborhood watch. Bewitched fans, Darrin #2 plays a cop! Three’s Company fans, Felipe plays a burglar. The Munsters fans, Grandpa plays Mary Wickes’ husband! All that, plus Lucie, Gale, Mary Jane, and Lucy! In this wonderfully funny installment, Lucy repeatedly harangues the two cops hired to watch their street after a rash of burglaries. Naturally, she’s soon confronted with a REAL burglar. Top-notch script with some excellent guest stars makes this episode a series classic. Harry and Lucy scheme to get back the agency after he sells it to an insufferable businessman. 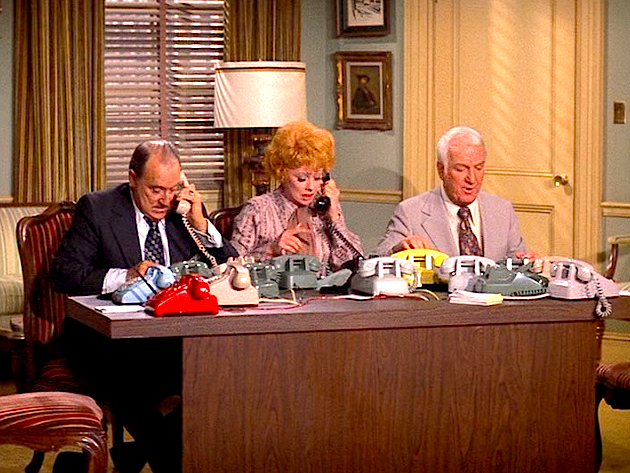 Ann Sothern’s boss, Don Porter, plays the new owner of the Unique Employment Agency after Harry has sold the agency (once again, because remember, he sold it at the end of Season Five too). Lucy has been retained as his secretary, but when she and the retired Harry both find themselves miserable, they scheme to get it back. Ordinary premise with a slightly inferior climax, this episode makes the list for a really funny block comedy scene where the trio unknowingly end up as receptionists at a bookie joint. Lucy must play nurse and housemaid for Kim, Harry, and Mary Jane all at the same time. This episode, perhaps more than any other, demonstrates this series’ most effective use of its ensemble as a force for comedy. 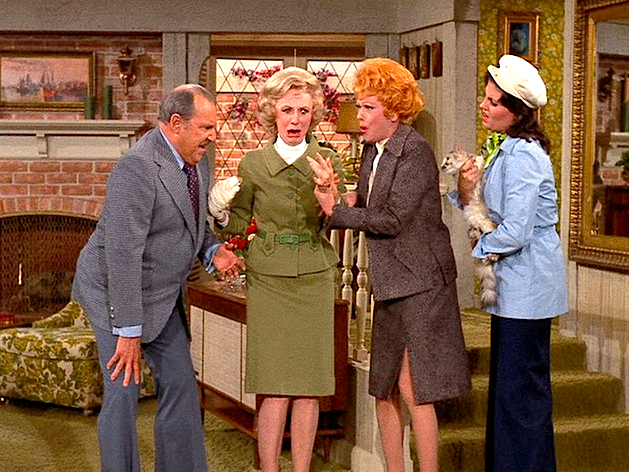 Lucy, like Jerry Seinfeld or Mary Richards, is in the center of all the lunacy (or in this case, neediness) surrounding her — courtesy of Harry, Kim, and Mary Jane. A lot of fans cite this as one of their all time favorite episodes, but while I appreciate the solid script, I don’t find it hilarious. That being said, it is amusing, and a nice change of pace. Kim and Lucy enter a Lucille Ball lookalike contest. With all the stars that Ball’s characters have encountered over 23 years in television, it’s almost surprising that she’s just now getting around to meeting herself! 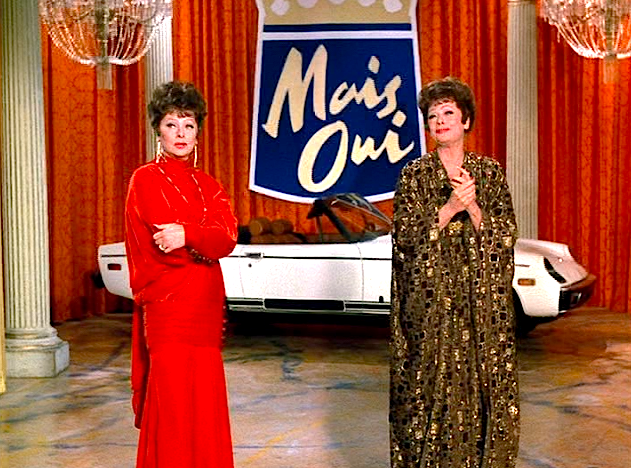 In this delightfully “meta” episode, which really serves as a 25-minute promo for Lucy’s misguided (and I say that with love, Lucy fans) screen adaptation of Mame, Lucy Carter comes face-to-face with Lucille Ball. Some laughs, some gimmick; all in all, a very entertaining installment — with an appearance by Carole Cook! Lucy feels like a nuisance when she comes to stay with Kim for the weekend. If only the series could have been this simultaneously funny and truthful in every episode throughout its six-year run, its reputation would be totally different! This is, simply, an outstanding episode that presents the relationship between Lucy and Kim in a most realistic light. And, even more importantly, it’s very funny! 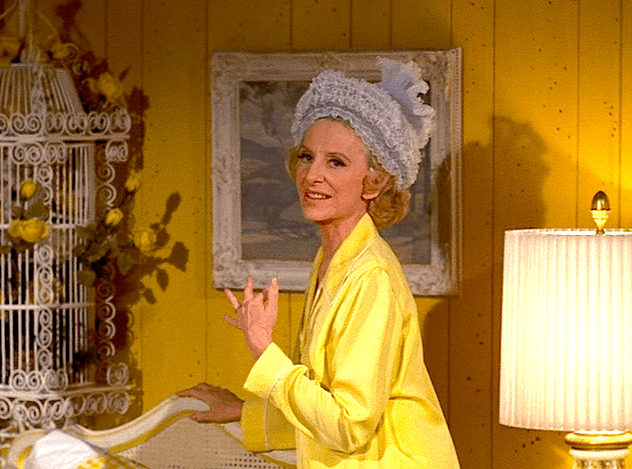 Lucy’s attempt at yoga is ever funnier than it sounds on paper, and her moment with Dirty Jack (director Jack Donohue) is endlessly amusing. A surprisingly fresh and superb installment, this is one of the best of the entire series. Kim poses as an inefficient young waitress after a woman comes to Lucy with a case of age discrimination. 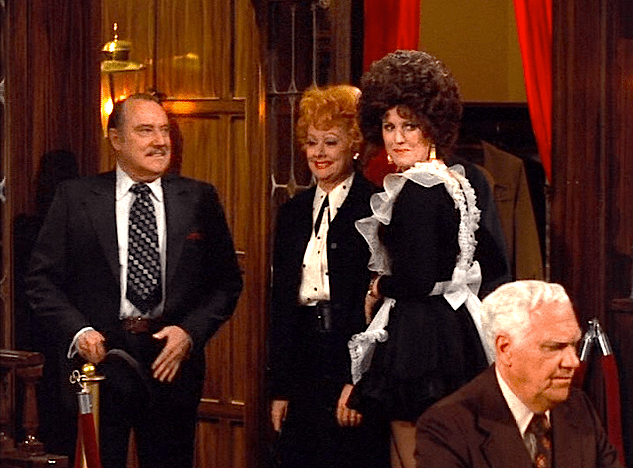 This is a very funny episode and probably the best performance Lucie Arnaz ever gives on the series. Watching her develop from awkward teen performer to capable comedienne can admittedly be painful. But when she really comes out to deliver — like in this episode — it’s totally worth it. However, as a series finale, one wishes that Lucy and Gale got more to do. So, while a well-written and laugh-out-loud installment, I wish the airing order was reversed with the episode above. 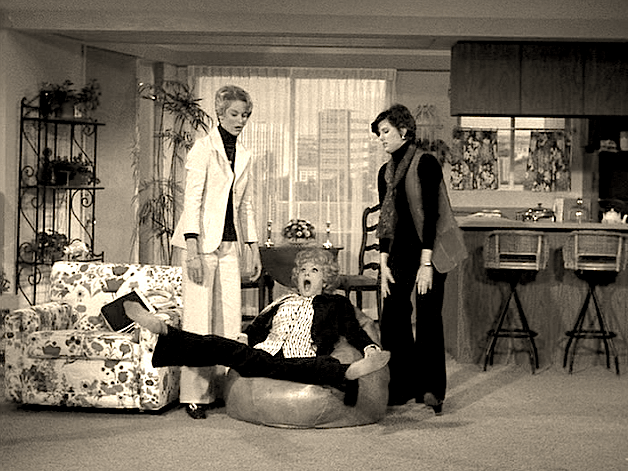 Other notable episodes — more notable than most from other seasons of this series — include: “The Bow-Wow Boutique,” in which Lucy, Lucie, and Gale, get some amusing physical comedy thanks to some four-legged friends, “Lucy Gives Eddie Albert The Old Song And Dance,” which has a moderately good script and a few nice moments, “Tipsy Through The Tulips,” which, naturally, guest stars Foster Brooks, “Lucy And Chuck Connors Have A Surprise Slumber Party,” which culminates in a nice gag in which Lucy and Chuck wind up in bed together, “Milton Berle Is The Life Of The Party,” which is perfect for Milton Berle fans — he’s great in it, and “Mary Jane’s Boyfriend,” the only episode of this series to feature a story dependent on Croft’s character. I wish I could have included all of these with the above! 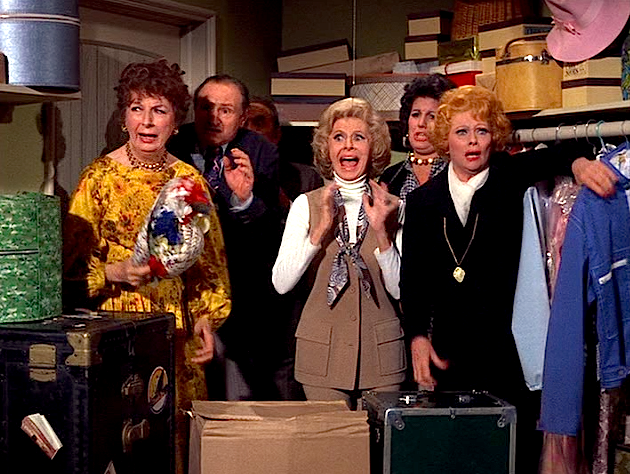 *** The MVE Award for the Best Episode from Season Six of Here’s Lucy goes to…..
Come back next Tuesday as we start a series of posts on the best from The Mary Tyler Moore Show! And tune in tomorrow for another Wildcard Wednesday! 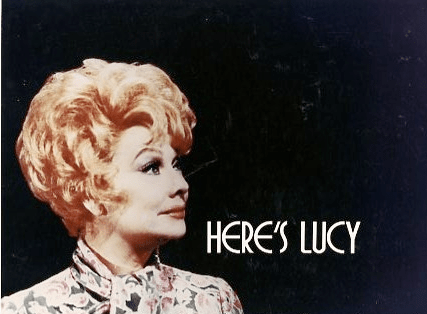 If you haven’t already, be sure to check out our other five posts on HERE’S LUCY, along with the entries for Lucille Ball’s three earlier series! I recently began re-watching HERE’S LUCY on Hulu. I can’t get over how fresh and funny the later seasons are compared to the early ones. It’s a great blend of classic 50s slapstick and 70s character driven comedy. Too bad the entire show couldn’t have taken that direction. Hi, Brandon! Thanks for reading and commenting. Agreed. Everything about the show gets tighter with Carroll and Davis back in the fold, and even though all of the jokes and scenarios are routine and generally uninspired, the focus afforded within each script makes the show (and its players) more often able to seek and elicit genuine laughs. Having only found your blog within the last year, it’s been fun going back and reading your thoughts on many of my other favorite shows. Hope you don’t get annoyed with me commenting on stuff you wrote over two years ago. Not at all! Although I believe my commentary has gotten better over time (and I wish I had been producing my current quality of material from the beginning), I appreciate having dialogues about all the shows discussed here. As I’ve noted before, the blog started with Lucy, and it’s going to end with her too — when I go back and re-cover I LOVE LUCY, as a means of illustrating the evolution of both my abilities and my sensibilities. Awesome. I have always loved Lucy from the time I was 5 probably. I’m sure we could chat for hours just about her shows. Ha. Yes, sir! 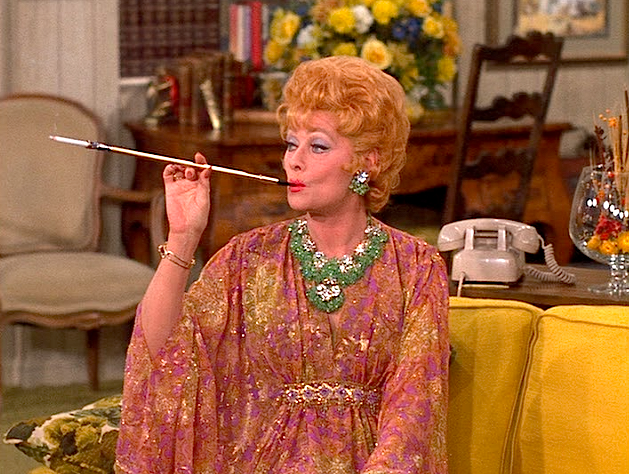 I LOVE LUCY is still my gold standard.